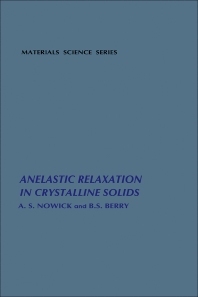 Anelastic Relaxation in Crystalline Solids provides an overview of anelasticity in crystals. This book discusses the various physical and chemical phenomena in crystalline solids. Comprised of 20 chapters, this volume begins with a discussion on the formal theory of anelasticity, and then explores the anelastic behavior, which is a manifestation of internal relaxation process. This text lays the groundwork for the formal theory by introducing the postulates. Other chapters explore the different dynamical methods that are frequently used in studying anelasticity. The reader is then introduced to the physical origin of anelastic relaxation process in terms of atomic model. This text also discusses the various types of point defects in crystals, including elementary point defects, composite defects, and self-interstitial defects. The final chapter provides relevant information on the various frequency ranges used in the study. This book is intended for crystallographers, mechanical engineers, metallurgical engineers, solid-state physicists, materials scientists, and researchers. 8.2 Concept of an "Elastic Dipole"